Grange Lodge is a modern stone-fronted luxury cottage, located on the Strokestown to Drumsna road overlooking Grange lake part of the river Shannon. Only 2 hours from Dublin, Strokestown is a heritage town in the Irish midlands – home to Strokestown Park House and Famine Museum and St John’s Genealogy Centre. It is a popular angling centre for course and pike fishing being surrounded by 65 lakes within a seven mile radius. This gorgeous stone-fronted house is located 4.5 miles from town, in a spacious garden adjacent to Grange lake and harbour which holds good stocks of Pike, Bream, Rudd and Hybrids. This is an ideal touring base boasting a variety of attractions from fishing to golf and horse riding and nearby a children’s playground and tennis court. 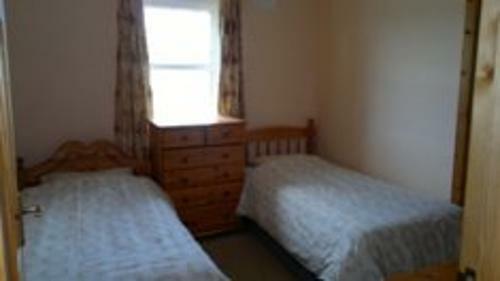 o The cottage consists of four bedrooms (All ensuite*). o Bedroom 1: Double bed, ensuite bathroom with electric shower. TV with satellite channels. o Bedroom 2: Double bed , ensuite bathroom with electric shower. TV with satellite channels. o Bedroom 3: Double bed, ensuite bathroom with power shower. o Bedroom 4: Twin bed room, ensuite bathroom with power shower. o Sitting room: Has 28″ T.V with satellite channels. Open fire with logs or turf available on request. Luxurious leather sofa suite. o Kitchen: Fully furnished with all modern appliances including, electric oven, gas hob, microwave oven, kettle, coffee maker, toaster, spacious fridge and freezer, together with cutlery, cooking utensils and all necessary kitchen furniture. The kitchen is fitted with window blinds. o Utility room: Contains clothing washing machine and additional utensils such as hair dryer, iron, ironing board, hoover. clothes horse. o Main Toilet: Contains toilet and, wash hand basin. o The Cottage is heated by oil fired central heating which can be regulated to activate on a timer system. o Grange lodge is completed to a very high standard, while we request our guests to leave the cottage as they would expect to find it, the cottage is cleaned and observed between guests by dedicated family involvement. o Rubbish is separated for recycling in separate outside bins. o Oil and electricity is metered and customers pay the current rates for electricity which is communicated at time of arrival.